This slate from Africa has a brown to black base color with a top layer of oranges, reds and yellows. It is a hard, dense material with medium cleft surface. Interior and exterior use. Echeguren Slate was founded by Alex Echeguren in 1983 and incorporated in California in 1986. The company initially specialized in the importation of Spanish roofing slate before expanding into other slate and stone products. The 1980s and 1990s were a time of design innovation and growing interest in natural products for architectural use. 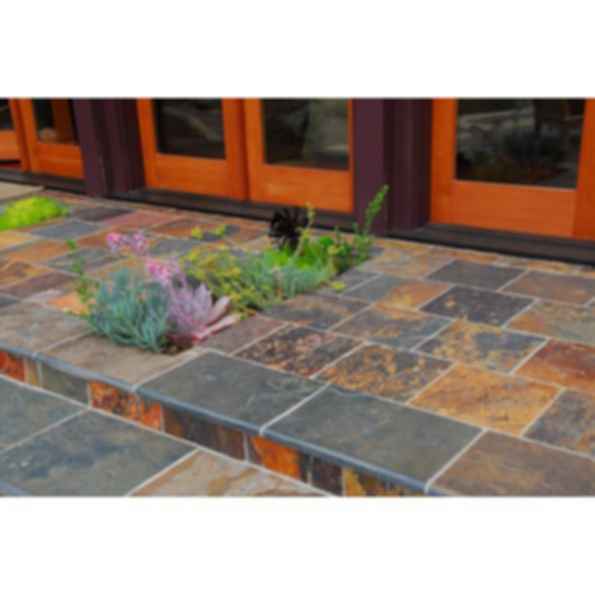 Echeguren Slate was a pioneer in introducing exotic and colorful slate, sandstone, limestone and quartzite from all over the world into the U.S. market. Echeguren Slate has maintained focus and expertise on textured stones of a non-polished nature. The company has available one of the largest product lines of high quality and unique stones of its type from the U.S., Brazil, China, India, Spain, Africa and other countries. The company offers a full color palette and with various textures for use in multiple architectural and design styles. More Products from Echeguren Slate Inc.